Aside from the Y6 Pro and Y7 Pro, another Huawei Y series phone might go official in the Philippines soon. To launch in PH soon? At Lazada, Revu spotted a pre-order link of the Huawei Y Max. The link also revealed the PHP 16,990 price tag of the said device. 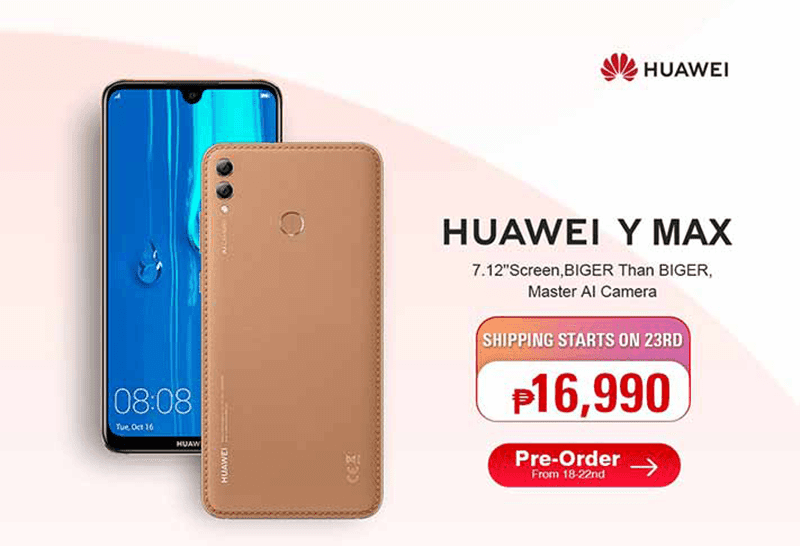 The Huawei Y Max will be on pre-order starting Feb 18 to 22, 2019. Shipping starts on the 23rd. To recall, Huawei Y Max is a massive phone with 7.12-inch dewdrop screen. It has 2244 x 1080 resolution, Snapdragon 660 SoC, 4GB RAM, 128GB storage, 5,000mAh battery, 16MP + 2MP dual-camera at the back, 8MP f/2.0 selfie camera, 4G LTE, and dual SIM slots. But, it could be a premature post by Lazada. The e-commerce website took their post down.